Summary: Eighty percent of surveyed respondents said that the experience with any company is as important as its products or services. How to ensure the experience of your bank customers is exceptional. Cookies in the technology world are messages that web servers pass to one another when internet sites are visited. 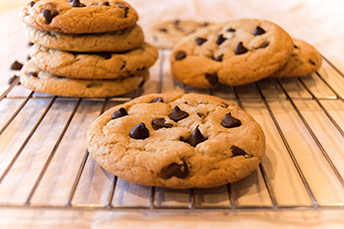 They don't taste nearly as good as your favorite, freshly-baked cookie though. That said, since the EU passed the General Data Protection Regulation (GDPR), the number of third-party cookies in use has dropped 22% on European news websites. The law has clearly taken a huge bite out of those cookies. The data shows customer privacy is serious business worldwide and it will only get more difficult in the future. This is especially true when you consider the high level of business emphasis on ensuring a great customer experience. "Customer experience" is a term that gets bandied about by many companies, including banks. As expectations for a great customer experience rise exponentially in this hyper-connected, bank-anywhere age, we provide you with some thoughts from a recent study on the subject. A study by Salesforce finds a customer's overall experience with any company or service provider is just as important as what the company sells. In fact, 80% of the 7,000 consumer and business buyers surveyed for the Salesforce report said this was true. Further, 57% said they stopped using a particular company's products/services because one of its competitors provided a better overall experience. It looks like loyalty is fleeting. Having long differentiated themselves from larger banks based on customer connections and tight relationships, we wonder what the impact will be to community banks. It would seem community banks would have an inherent advantage in offering a better banking customer experience. But, as more bank interactions move to electronic channels, all banks will need to stay on top of technology, integration and operations to stay in the game. Case in point: 70% of respondents said connected processes, like smooth handoffs between departments or delivery channels, and personalized engagement when obtaining a new service or account, are critical in getting and keeping their business. The challenge for community banks is not necessarily to try to beat bigger banks at their own game. Rather, the goal should be to translate business built on personal relationships and human touch into smooth and efficient digital experiences too. This is sometimes easier said than done though, as customers are increasingly unwilling to sacrifice cost, convenience or time. The survey found 66% said it takes longer for a company to win them over with new products and services these days; yet, 63% noted they expect companies to offer new products and services more frequently than ever before. This is a challenge, but the rewards can be worthwhile, given 67% said they would pay a premium for better experiences. With this incentive and others, community banks should be actively moving to enhance both digital and physical experiences. To succeed, you need to connect all the dots smoothly with intense personalization. In fact, 59% said customized engagement based on past actions is critical to winning business. It is not easy to continue to provide a meaningful customer experience. However, it is worthwhile. Just remember to follow all customer privacy guidelines as well, to stay safe while connected. 1) Countybank ($404mm, SC) will acquire independent insurance broker B.A. Bennett Insurance (SC) for an undisclosed sum. Bennett offers personal and business insurance. 2) Fifth Third Bank ($141B, OH) will acquire wealth advisory firm Franklin Street Partners (NC) for an undisclosed sum. Franklin offers trust services and has over $2B in assets under advisement. 3) Bay-Vanguard FSB ($167mm, MD) will acquire Kopernik Bank ($158mm, MD) for an undisclosed sum. 4) Moody's will acquire commercial real estate data provider Reis Inc. for $278mm in cash (100%). Reis provides analysis and detailed information on 18mm commercial properties in the US covering 275 metropolitan markets. The Wall Street Journal is reporting that legislators in CA have passed a bill that would mandate publicly traded companies based in the state to put female directors on their boards. If signed into law, companies would have until the end of 2019 to have at least 1 woman on their board (for board of 5+ directors) and 3 women by the end of 2021. A new law that goes into effect in Sept gives parents the ability to check their children's credit reports and freeze it at no cost. The law was in response to the huge data breach at Equifax and it also allows adults to do unlimited free credit freezes as well.